There is a communal area conveniently located to all bedrooms which is well stocked with an array of tea/coffee/hot chocolate options, something to snack on, as well as filtered water, a fridge, ice in the freezer and for your convenience an iron/ironing board. If you bring in snacks you’ll find platters, wine glasses etc. to complete the picture. The “drawing room” or formal lounge room downstairs is a space guests gravitate towards when looking for a quiet time to read or catch up with emails or have a private conversation. The upstairs guest lounge is more of a social hub with lounge, table/chairs, chess, board games, DVD library, another TV, free book exchange and complimentary port. 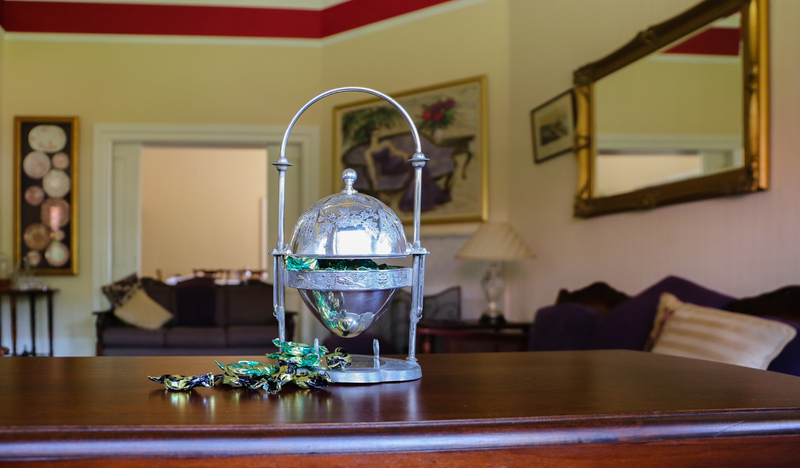 The downstairs “recreational room” (originally the ballroom) is where you can enjoy a trip down memory lane playing the Pianola, cards and board games or just sit and relax and enjoy a drink from our a small licensed bar. In summer choose one of our outdoor spaces, grab a cushion, your camera and enjoy the colour of sun set on the mountains, the bird life, our ever changing seasonal flowers and the peace and quiet Penghana offers. Enjoy a cool drink, a wine or a coffee and solitude or time together with your friends or loved one. For those who want just a little more activity and a some competition, we also have croquet and bocce. Features a small selection of Tassie wines, beer and cider. With prior notice and given availability, we can also provide a confidential meeting room for business travellers. Penghana offers safe parking for cars. We also can offer undercover parking for bikes.